The Penguins of Madagascar: Dr. Blowhole Returns – Again! 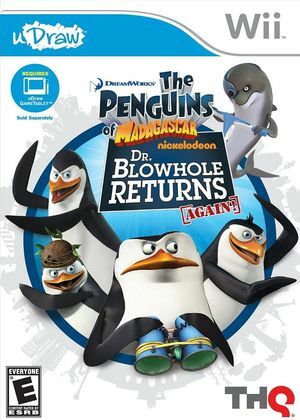 When a diabolical dolphin tries to take over the world, it can only mean one thing: Time to call in Team Penguin in The Penguins of Madagascar: Dr. Blowhole Returns – Again!! Join the cracked commandos - Skipper, Rico, Private, and Kowalski - on an adventure told through three in-game episodes. Go from the zoo to the lair of Dr. Blowhole on a mission to stop the dreaded dolphin before it's too late. Solve puzzles, complete challenges, assemble bizarre spy gear, and defeat Blowhole and his lobster minions. You'll need the talents of each penguin to complete your mission. Color the action with the stylus-based controls of the uDraw GameTablet. Just remember, your team looks best in black and white! The uDraw GameTablet required by The Penguins of Madagascar: Dr. Blowhole Returns – Again! is not currently emulated by Dolphin. A real uDraw GameTablet and Wii Remote are required to play. The graph below charts the compatibility with The Penguins of Madagascar: Dr. Blowhole Returns – Again! since Dolphin's 2.0 release, listing revisions only where a compatibility change occurred. This page was last edited on 13 January 2018, at 14:50.